On January 15, 2018 at approximately 12:40 a.m., troopers from Troop G-Bridgeport were notified of a wrong-way driver traveling I-95 in the area of exit 6 in Stamford. The wrong-way driver was reportedly traveling northbound in the southbound lanes. With the assistance of DOT highway cameras, troopers located and observed the vehicle, a 2016 Audi, being operated at a high rate of speed in the left and center lanes northbound on the southbound side of I-95. There was moderate traffic on the highway and troopers observed the Audi nearly hit several vehicles. Troopers responded to the area and slowed southbound traffic while one trooper continued driving southbound on I-95 with his cruiser emergency lights and siren activated. The trooper drove back and forth across the highway lanes in an attempt to get the attention of the Audi operator. 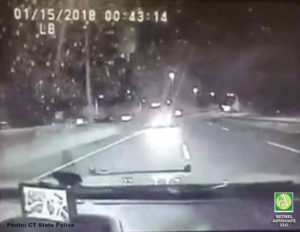 The trooper saw the Audi approaching him traveling northbound in the southbound left lane in the area of exit 12 in Stamford, however, despite the cruiser having its emergency lights and siren activated, the Audi operator did not reduce speed, yield to the emergency vehicle or stop. As the Audi continued to approach, the trooper moved closer in another attempt to get the operator’s attention. The operator still continued traveling, therefore the trooper made the decision to use his cruiser to stop the wrong-way driver. The Audi and cruiser sideswiped disabling both vehicles. The trooper was not injured and was able to exit his cruiser. The Audi operator, Ashton Steen, was not injured either. As troopers spoke with Steen, they determined she was under the influence of alcohol. Steen also stated that she had been consuming alcohol and believed she was in New Jersey. Steen failed a series of field sobriety tests and was taken into custody. Ashton Steen (dob 8/30/91) of Darien was charged with Reckless Driving, Reckless Endangerment 2nd Degree, Operating Under the Influence of Alcohol and Operating the Wrong Way. Steen was released after posting $10,000.00 bond and scheduled to appear in Stamford Superior Court on February 20, 2018. -Slow down and safely move to the right shoulder or as far to the right as possible. -If it can be avoided do not slam on the brakes, especially if there is a vehicle directly behind you and avoid swerving into other lanes or off of the road. -Honk the horn, flash your vehicle’s headlights and turn on the hazard lights. It’s possible that you may be able to make the wrong-way driver aware that they are traveling in the wrong direction. -As soon as it is safe to do so, call 911 and report the wrong-way driver. Be sure to give your location including direction of travel and closest exit. And if you are able to, provide a description of the vehicle. -NEVER turn around and follow a wrong-way driver! -When driving on the highway at night, especially after midnight, travel in the center or right lane. Wrong-way drivers often travel in the left lane thinking they are in the right lane for their direction of travel. ***Please remember that not all wrong-way drivers are under the influence of alcohol and/or drugs. Some wrong-way drivers may be experiencing a medical emergency, while others may be disoriented or confused by signage.